Developing robots that are capable of taking care of seniors is the goal of an increasing number of robotics companies. While there are many economic and social factors to encourage this trend, the ethical issues pertaining to the use of robots as caregivers requires careful consideration. Data from our latest poll suggest that readers are optimistic about the role of robots as care assistants for senior members of their families. In particular, a number of roboethicists have voiced concerns about the possibility that care robots will further isolate the seniors from social contact. Social isolation of seniors is a global issue and a known health risk for seniors. For example, in the UK, 17% of seniors have less than weekly, and 11% have less than monthly, contact with family, friends, or neighbours; in Canada, 20% of seniors do not participate in any weekly or monthly social activities; in the United States, 28% of seniors aged 65 and older lived alone in 2010 — that’s about 11.8 million people — and the number increases as they age. Somewhere hidden in these statistics is the fact that the caregivers of these seniors (if they have one) naturally take on the role of providing some level of social interaction with the seniors on a regular basis. If robots are recruited to fill the role of caregivers, would this further isolate seniors? 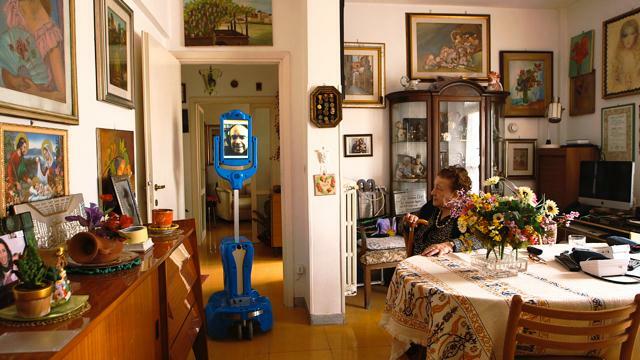 Some people suggest that a social and interactive care robot could keep seniors company. Others conjecture that care robots will be useful in some ways, but perhaps not enough to provide the type of human social interactions that people need. However, it could provide a mechanism through which seniors can connect with family and friends, a Skype-on-wheels system for example. According to the results from our poll, the majority of our participants were of the opinion that robots will enable seniors to socialize with other people better, using teleconferencing systems such as Skype/FaceTime. However, they were split on whether a robot itself will be able to keep a senior company. While the majority (53%) said that the robot itself will be successful in keeping seniors company and also enable seniors to socialize with others, 28% said that only the latter will be true. Only 6% of our participants said that, while a robot will be successful in keeping seniors company, it will result in further social isolation. It is difficult to draw definitive conclusions based on the small number of respondents who participated in this poll. But we did observe an interesting trend. The majority of participants who self-reported as having a background in robotics or related technical field/profession (60%) said that robots will be successful in keeping seniors company and allow social interactions with other people; only 44% of non-roboticists said the same. Despite the optimism (at least by the robotics community), there remains concern that dependence on robot caregivers could reduce physical human contact, even if it helps facilitate remote social interactions. If forms of socializing fall into a ‘social interaction hierarchy’ of sorts, with in-person interactions being considered the most valuable, will increased remote socialization come to be considered as ‘better than nothing’ even if it becomes an excuse for infrequent in-person interactions? We’ll follow this question up in a future poll, and in the mean time leave that question up to you to discuss with the seniors in your network. When we asked about our participants’ comfort level in having robots to perform particular daily care activities, we found that 66% of people would be comfortable having a robot entertain and socialize with senior members of their family, echoing the optimism mentioned above. In general, tasks that people felt comfortable transferring to a robot were those that do not require physical contact with the senior. 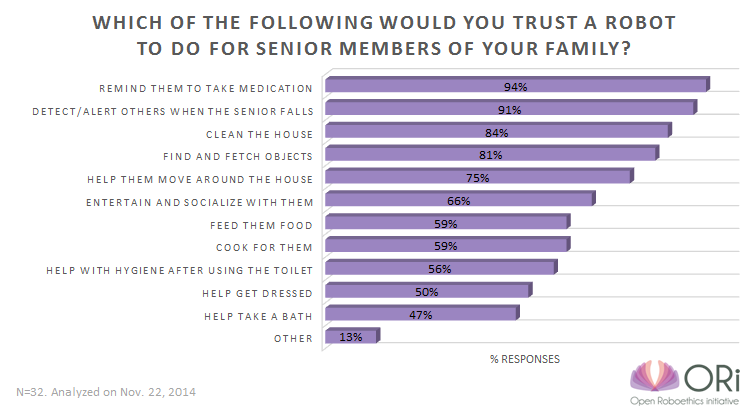 For example, reminding seniors to take medication (94%), detecting and alerting others when the senior experiences a fall (91%), and cleaning the house (84%) were tasks that received the most number of votes, and coincided with robotic solutions that are actively being explored or exist already. Meanwhile, more interactive forms of care, such as helping seniors to take a bath (47%), get dressed (50%), or use the toilet (56%) received relatively fewer votes, along with food-related tasks such as cooking for (59%) and feeding (59%) seniors. The relationship between this trend and safety concerns, users’ sense of personal control, and other factors requires further investigation. The fact that only about half of participants feel comfortable having a robot help seniors take a bath or assist with personal hygiene provides an interesting perspective to the use of robots for the potentially essential care task. From our earlier poll-based discussion on bathing, we found that robot bath assistants have the advantage of providing privacy, while this benefit may need careful balancing with the sense of control it provides to its users. People’s comfort level in using robots for such highly physical and private care tasks may need some convincing trial runs before consumers feel comfortable with them. Do you have questions or topics you’d like ORi and Robohub to cover in our poll-based discussions? Send us an email (ajung@openroboethics.org). The results of the poll presented in this post have been analyzed and written by AJung Moon, Mike Van der Loos, Shalaleh Rismani, Joost Hilte, Julio Vazquez and Elizabeth Croft at the Open Roboethics initiative.